Our Designer pet stairs for your bed offer deep steps for your dog's comfort while moving up or down the stairs. Beds and furniture are various heights. That's one reason why we offer the Designer 3 step bed stairs with wider and deeper steps. We know that steps and ramps can relieve joint stress even in younger dogs. Don't wait until your dog has a joint problem to get stairs for them. 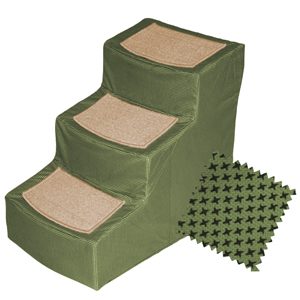 Help prevent or delay joint issues in your dog with their very own pet stairs. These are "snap together" stairs so no tools are required. Detailed assembly instructions are included. 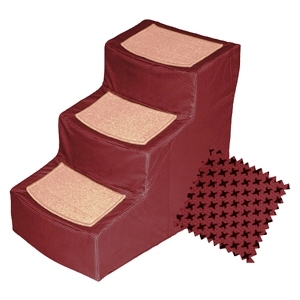 If you feel that a higher bed stairs may be needed please take a look at our 4 step designer stairs. You will find warranty information here.